“The iron that gives the sands their brilliant, rusty red appearance must have magnetic qualities – you just keep getting pulled back!” says Prof. Chris Dickman. 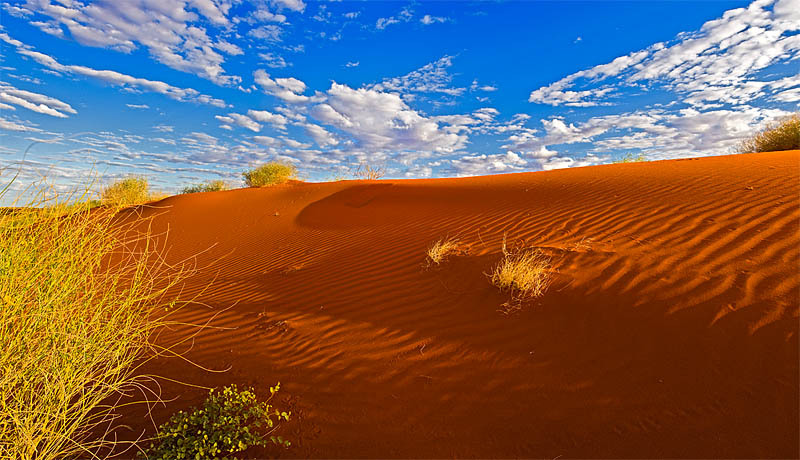 The red sand and blue skies get under your skin and you want to learn more about the Simpson Desert. Photo by Aaron Greenville. Prof. Chris Dickman and A/Prof Glenda Wardle head up the Desert Ecology Research Group, who along with Bobby Tamayo, Chin-Liang Beh, David Nelson, myself, students and volunteers make the 2.5 day drive from Sydney to our field sites in south-western Queensland. “The possibility of new discoveries and a genuine curiosity for how a mostly dry environment can support abundant life keeps us keen for more.” says A/Prof Glenda Wardle. The red sand gets under your skin and we gladly leave city comforts behind and head into the outback to pursue new research questions. 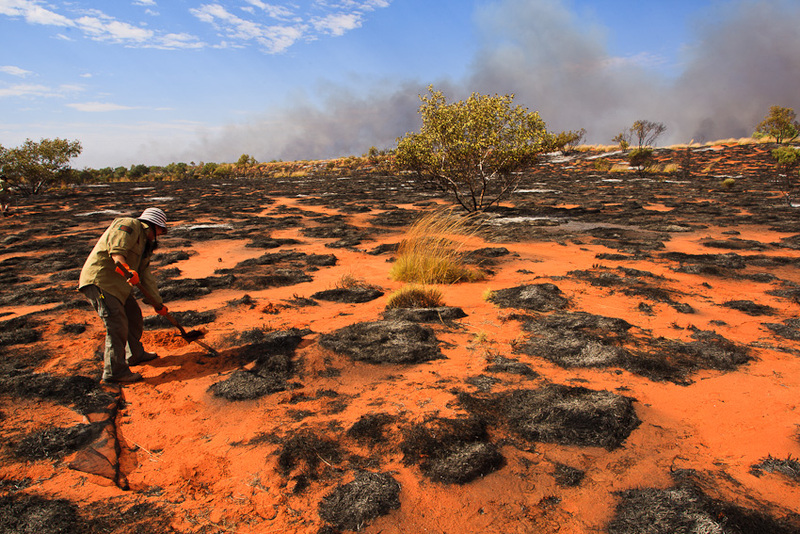 Over the last 25 years we have expanded our efforts across the eastern Simpson Desert. The first trip in January 1990 consisted of one 4WD with four people to survey the small mammals, reptiles and vegetation at one site, but now crews head out several times per year. Our annual ‘big trip’ requires four 4WDs and 20 people to survey 12 sites across an area of 8000 km². More recently, the project has grown with collaborations, such as the Nutrient Network, an international effort to study how nutrients change productivity and diversity in grasslands around the world. Our studies form part of the Long-Term Ecological Research Network and we are collaborating with AusPlots Rangelands and the remote sensing facility, AusCover, all national infrastructure facilities of the Terrestrial Ecosystem Research Network. When you think of a desert, many people think desolate, but over the past 25 years we have discovered that the Simpson Desert is the most diverse place in the world for reptiles and insectivorous mammals. “The abundant plant life supports hundreds of species of pollinators such as the native bees and wasps, many of them still undescribed. The world below ground is just as rich with burrowing frogs, termites and importantly the seeds that bring new life to the desert after big rain events” says A/Prof Glenda Wardle. In addition, “Australian deserts do not ‘behave’ in the same way that other world deserts do, and are especially different from the once-paradigmatic deserts of North America; the high unpredictability of the rainfall regime has probably been a key driver of many of the biological adaptations that characterise our desert biota; large rainfall events can be – paradoxically – very bad for many native species and communities because they provide windows of opportunity for invasion by weeds and pest species. You need to be there long-term to document and understand the changes that occur” says Prof. Chris Dickman. Our long-distance relationship with the desert has endured droughts, floods, fires and flies. Photo by Aaron Greenville. Even after 25 years there is still more to learn from our relationship with the desert. “We still have to discover how to use the desert regions in a sustainable manner, how to effectively manage the threats to their biological riches, such as from introduced predators and feral herbivores, how (and where) some of the key species persist during the long periods of rainfall deficit, and what will be the effects of climate change on the character and composition of deserts in future” says Prof. Chris Dickman. The many people who have joined us over the years have contributed to the work and the social life of our desert trips and we thank them for enriching our experience and helping us to deliver new knowledge to help sustain this important ecosystem. This article was also published in Biology News July 2014. Just let me wonder about the universe, using science as my guide. I'm an Ecologist who loves deserts, photography, and commenting on politics. This entry was posted in Conservation, Ecology and tagged anniversary, Australia, Biology, Central Australia, conservation, ecology, long-term research, science, Simpson Desert. Bookmark the permalink.